Facebook has rolled out the “Embed this Post” function for all pages. What this means is that you will now be able to capture the code from a public Facebook post and embed that post into a web page. The embedded post will look almost exactly like the post on a Facebook wall. Imagine the possibilities to embedding posts into web pages. 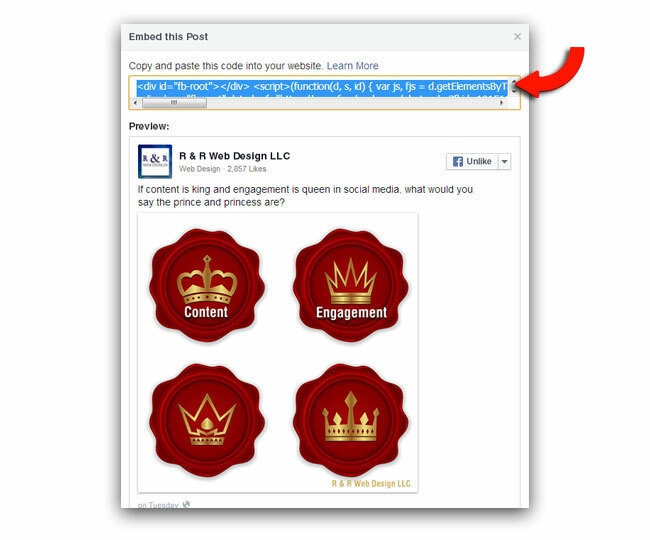 Let’s take a look at an actual example and steps that you can take to embed a Facebook post into a page on your website. We will discover an added feature that you may definitely like. To test out this new feature, the following is an embedded Facebook post from R & R Web Design LLC’s Facebook page. To see the actual post and comments, click anywhere on the embedded post above and you will be taken to the post on the Facebook page. One interesting added feature is that web page viewers are able to share the post directly from the web page that the post is embedded into. 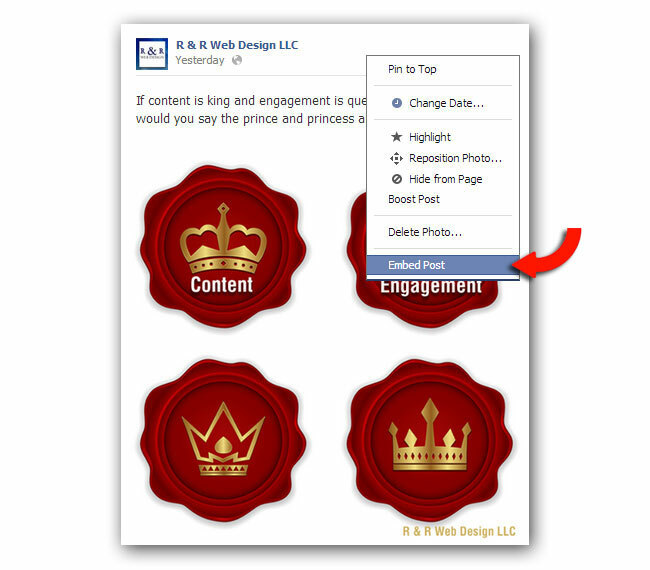 To embed a Facebook post, hover over the upper right of the post and view the drop down menu. Note: According to Facebook only public posts for both profiles and Pages can be embedded. Click the “Embed Post” link from the drop down menu. You will next be taken to a pop up of the post with code highlight at the top. Copy this code and simply paste it into the HTML of any web page. If the post is deleted from the Facebook page, it will no longer appear on the web page. The size of the embedded post is the exact size that it displays on Facebook. Currently, there is no ability to customize the display. If the original post on Facebook has “see more” text, you will be able to click the “see more” link in the embedded post to see more on your web page. What do you think of the new Facebook embedded post option? Do you think that you will use it on your website to drive more traffic to your Facebook page? 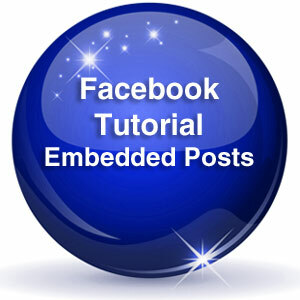 Thanks for sharing how the embedded posts work. I look forward to using this feature on both my own and my client’s pages. You are very welcome, Jen. I would love to see how you use them when you do. Sounds very interesting, Robin, thanks for the great tutorial. I have not thought yet about how I would use it on my blog yet. Perhaps I can create some testimonials from comments and thanks that I get on my Facebook wall? You are very welcome, Delia. I am happy to hear that you found this tutorial helpful. Your idea of including an embedded Facebook post with testimonials sounds great. I would love to see it if you do give it a try. Thanks for keeping my Facebook knowledge up-to-date. I appreciate the easy to follow tutorial. How would you suggest using this new technology for the greatest impact? I update my Facebook page a few times each day, blog 3 times a week, and change the content on my website a few times each month. You are very welcome, Lisa. I’m glad that you found the tutorial helpful. A few suggestions for using this feature include: embedding a public post from a news event on another Page and including an article about the event. Another idea would be to include a post from your own Facebook page about a Facebook promotion or event. Nice! I love to learn more every day! Thanks for sharing this information, and thanks to Delia @ Blog Formatting to share it in Facebook… I’ll give it a try. Remy, thank you for stopping by! I am glad to hear that you find this helpful. Delia has been very kind by sharing this on Facebook. I would love to hear how it goes when you give this a try.